These two AidCamps were held in conjunction with our partner organisation Rural Community Development Programme (RCDP) in the village of Rampur in the Chitwan valley region of Nepal, where RCDP has built an orphanage for some of the many dispossessed and homeless children of the country. These two projects provided a community primary school next to the orphanage, both to give the orphans a place to catch up on their education and to provide a local school for the community, where previously the children were having to walk for half an hour to get to the nearest one. The major construction of the five room school was completed by local labourers, paid for by the AidCamps, before the first group arrived. 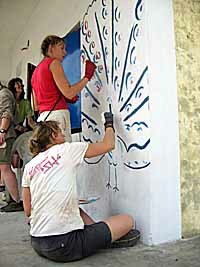 The volunteers set floors and plastered, painted and decorated the building, including painting murals on the outside and educational themes on the inside. The volunteers were also taken on visits to see other projects in the area, as well as on several local and regional sightseeing trips. The first group got to experience Holi, the Hindu festival of colours. "Not without a fair amount of trepidation did I venture to the Nepal AidCamp. 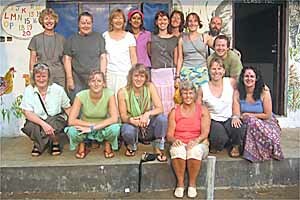 Could it match the experiences of my previous AidCamp in Southern India in 2004? I was about to find out. After meeting the group in Kathmandu and a day's acclimatisation we embarked for West Rampur. A long but scenic bus journey took us to the Chitwan Valley which was to be our home for the next three weeks. On arrival we were made to feel very welcome by RCDP, the community and all the children, garlands and bindis being the order of the day! The next day the project kicked in for real, early breakfast, malaria tabs, work gear and a jeep journey to site. Already women were working in the fields and the morning shift ox plough driver was furrowing the land. Children on their way to school waved enthusiastically practically the whole route. Perhaps knowing that when the volunteers had completed the new community school they wouldn't have to walk so far, and would have more time for their cornflakes! The building site was strangely quiet, no clunking or whirring of cement mixers, plenty of sand and gravel though! I wonder how that is going to get mixed. Manpower was the answer! Were Dan the Man (the local chief builder), his handful of trusty men and as motley a crew of volunteers you're likely to see this side of the Rio Grande, going to transform this brickwork shell into a vibrant community school? You'd better believe it! First task: level the floors, WHAT, no pneumatic tamping machinery! A section of tree trunk with two long wooden lat handles. Method: lift-drop-floor level; lift-drop again (mind your toes Sam)-more floor level. Simple but effective. Like every building site from Manchester to Manhattan everything stops for tea! In our case chai and biscuits, and even more biscuits! Day by day we marvelled at the progress (marvelled is perhaps a bit strong), we became more skilled at our various tasks, and found new ways of moving stones and getting dirty! Classrooms were painted and adorned with murals. A local artist showed us how to paint freehand, although Manina and Paula weren't paying attention that day! The walls were illustrated with educational 'stuff'; letters, numbers, tables, etc. Is 3 times 2 really the same as 2 times 3? The evening lectures were fascinating, particularly the post-graduate girls who spoke to us from their heart about the status of women in Nepal. They accepted our invitation to stay for dinner and we thoroughly enjoyed their company. 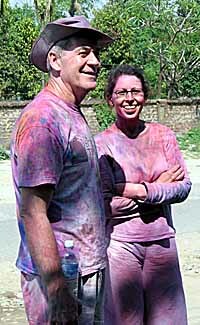 One of the highlights was the colourful Holi, paint water and much joviality, and all in the name of a religious festival! A picture of us made the local broadsheet (broadsheet is perhaps a bit strong) and we kept the village photographer in business for a week. Swimming with dolphins is alright but (and Hannibal will bear me out on this one) bathing in the river with full grown elephants is something to behold. When the mahout says roll over, they roll, and if you happen to be on their back you become acquainted with the river real fast! Final farewell and handover was both a sad and joyous occasion. Wonderful to see the completed project but sad to say goodbye to the children, the village community, and our friends at RCDP. Was it as good as my previous AidCamp? You'd better believe it!!!" "Words cannot give justice to how fantastic this experience has been! If you have ever thought about it, then just do it!!" "What an experience. For the first time I've been directly involved with a totally different culture and the people. Fascinating." "I've had an amazing experience. AidCamps could become addictive, holidays will never be the same again." "A very rewarding experience. Fantastic meeting all the kids and seeing their response to us as we built their new school." "Wonderful country, worthwhile project, wonderful group." "A great way to really get a glimpse of the reality of life for many Nepali people. Just wonderful." 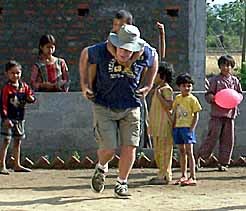 "A rare opportunity to meet and work with real Nepali people and really feel part of the community. Learnt to just be and live in the moment -- so refreshing!" "A succession of unexpected moments, thanks to this country, its people, the AidCamp group and the itinerary." "Come and see the world on the other side and live and feel the experience." "I am just glad that I could make a difference in the life of another, and would do it over and over again." "Though primarily a poor country, Nepal is rich in colour, culture and warmth." "Three of the best weeks of my life." "It was a truly worthwhile and memorable experience." "Words cannot give justice to how fantastic this experience has been! If you have ever thought about it, then just do it!!" "What an experience. For the first time I've been directly involved with a totally different culture and the people. Fascinating." "I've had an amazing experience. AidCamps could become addictive, holidays will never be the same again." "A very rewarding experience. Fantastic meeting all the kids and seeing their response to us as we built their new school." "Wonderful country, worthwhile project, wonderful group." "A great way to really get a glimpse of the reality of life for many Nepali people. Just wonderful." "A rare opportunity to meet and work with real Nepali people and really feel part of the community. Learnt to just be and live in the moment -- so refreshing!" "A succession of unexpected moments, thanks to this country, its people, the AidCamp group and the itinerary." "Come and see the world on the other side and live and feel the experience." "I am just glad that I could make a difference in the life of another, and would do it over and over again." "Though primarily a poor country, Nepal is rich in colour, culture and warmth." "Three of the best weeks of my life." "It was a truly worthwhile and memorable experience." "Any trip like this is always special but what makes it unique is the unexpected events and hurdles along the way. We had known that there would be political strikes that ban motorised vehicles from the roads just before we left, but were unsure how it would affect us. As it turned out it would have been a dream come true for a transportation enthusiast with the range of vehicles we used. Norris McWhirter would also have been keen to learn how many people we could fit in each! Due to the strikes we were unable to use any form of motorised road transport, so instead of going by bus to the project we had to make alternative arrangements. We took a short flight on a small, bumpy plane, taking us from the bustling streets of Kathmandu, over the rice terraces on the hills, and into the flat lowlands in the Terrai region. So, with our ears still popping and all a little dazed and confused we employed the manpower of 17 rickshaw drivers, and then became part of the real life version of the Wacky Races on an Oregon Trail of rickshaws through numerous sleepy, rural villages. Must have seemed like some sort of impromptu Mardi Gras for the people sitting on their porches enjoying the peaceful roads. The villagers looked on in amazement and laughed whilst the children all shouted hello-goodbye, which I think is actually one word. There was no fear of being stranded if the rickshaw succumbed to malfunctioning parts because throughout Nepal there is no need for the AA or Green Flag due to the handy toolkits stationed all along the roadside containing hi-tech tools such as rocks to whack the bike chain or wheel back into place. The joys of the various methods of transportation were unique and novel to say the least. I wouldn't like to divulge how the ox cart driver controlled his wayward ox, needless to say, it didn't look comfortable for the poor ox! The work on the school was busy going, but so rewarding that it never seemed to matter. There was no need for us to have previous skills in building and plastering because there was a full induction and on-the-job training by professional Nepali builders. They did find it rather amusing when our carefully and lovingly chucked cement slid off the wall and landed in a heap on the floor again!! We decorated the school with educational murals in the inside of the classrooms and a jungle on the outside. We found that even those who don't know one end of a paint brush from the other were happy to colour by number as long as they stayed in the lines!! Even with our less than perfect construction skills, the job was finished in time and the school was handed over to the community in a grand affair with music, and of course sweet tea and many biscuits. The local children from the orphanage and the community will be starting to use the school shortly. I think I can say from our whole team that we loved every minute of building it for them, and are delighted that the children we met and future students will benefit from an invaluable education to start them off in life. "Such a clever idea to enable us to experience another culture and put something back at the same time." "A wonderful chance to visit another part of the world and also achieve something worthwhile." "Unforgettable sight, all the villagers, young, adult, aged, waving us goodbye, thanking us, smiling and laughing. I hope we've learned from them, as they will learn in the school we built." "An incredible experience -- a holiday with a difference!" "The best way to experience a country, seeing the highs and lows and giving something back in return. You will enjoy all of it!" "To live, breath, and eat both the dust and delights that a country has to offer and love every second of it. Awesome!" "This was my first AidCamp and it surpassed my every expectation." "Another great experience -- 4th AidCamp!" "Who could go on a package holiday again after this?" "Takes you to places and shows you culture that is usually hard to come across." "A great way to be involved in an enormously worthwhile aid project, and experience the true spirit of Nepal." "Without a doubt, one of the best experiences I have ever had." "No better way to intimately get to know an area." "This was probably the best two weeks of my life -- I experienced a different culture in such an amazing and enriching way." "Such a clever idea to enable us to experience another culture and put something back at the same time." "A wonderful chance to visit another part of the world and also achieve something worthwhile." "Unforgettable sight, all the villagers, young, adult, aged, waving us goodbye, thanking us, smiling and laughing. I hope we've learned from them, as they will learn in the school we built." "An incredible experience -- a holiday with a difference!" "The best way to experience a country, seeing the highs and lows and giving something back in return. You will enjoy all of it!" "To live, breath, and eat both the dust and delights that a country has to offer and love every second of it. Awesome!" "This was my first AidCamp and it surpassed my every expectation." "Another great experience -- 4th AidCamp!" "Who could go on a package holiday again after this?" "Takes you to places and shows you culture that is usually hard to come across." "A great way to be involved in an enormously worthwhile aid project, and experience the true spirit of Nepal." "Without a doubt, one of the best experiences I have ever had." "No better way to intimately get to know an area." "This was probably the best two weeks of my life -- I experienced a different culture in such an amazing and enriching way."